An automotive fuel injection system is composed of different components such as fuel pump, injectors, fuel rail, regulators, computers, and sensors. The function of a fuel injector is to spray fuel as fine droplets depending on the airflow inside the engine. Fuel injection system helps to maintain the health of the engine as well as it reduces the carbon emission. It offers many benefits to the vehicles such as easy to start, smooth running of engine, fuel burning efficiency, saving the fuel by preventing excessive consumption, providing precise amount of fuel to all cylinders and increasing mileage of the vehicles. The automotive fuel injection system market is expected to expand at a CAGR of 5.2% over the forecast period i.e. 2017-2024. The increasing demand for fuel efficient vehicles and inflexible emission control norms taken by government are anticipated to drive the demand for automotive fuel injection system over the forecast period. 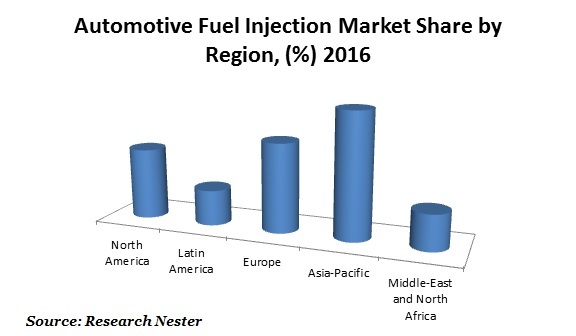 Geographically, Asia-pacific is the dominating region in automotive fuel injection market. Automotive production has experienced a rapid growth in the developing regions such as Asia Pacific and Central & South America in the recent past. With the rise in disposable income levels, the purchasing power has positively impacted the growth over the recent years. Increase in demand for two wheelers in the emerging economies such as India and China coupled with stringent emission control norms are supposed to play a key role in molding the automotive fuel injection system market in the next few years. Significant improvement in per capita income and rise in standard of living of the population in developing countries are some of the major factors responsible for rising demand for two-wheelers and passengers cars. The growth in the automobile market, coupled with the demand for more fuel efficient vehicles that meets emission norms, has resulted in an increase in the demand for better fuel injection systems. Improved fuel efficiency is achieved with proper cylinder to cylinder distribution of fuel, which results in less fuel consumption with the same output. The ability to accommodate alternate fuels and better diagnostic capability are expected to offer plenty opportunities to industry participants in the coming few years. However, stringent emission norms taken by government have resulted in ban on diesel cars in some countries. Besides this, the raw material prices are expected to negatively impact the industry growth over the forecast period which would further hinder the growth of automotive fuel injection system market globally. Growing environmental concern has resulted in the development of electric vehicles which would work as a substitute to conventional vehicles and are assumed to hamper the growth of automotive fuel injection system market.